The idea of telling a story through the perspective of a computer screen is nothing new – there have been a number of movies that have already used that particular angle, most notably horror film Unfriended (and its upcoming sequel Unfriended: Dark Web – and yes, I was just as shocked to learn that’s a thing about as much as you probably are), which have attempted to make mundane online things such as chatting via iMessage, FaceTime, Skype and other software seem suspenseful and, especially in that film’s case, completely terrifying. It’s not that bad a concept, in all honesty; in today’s world of heavy reliance on social media and the Internet, a film which uses that to not only tell a cohesive narrative but also mirror our obsession with applying a positive filter to our otherwise mundane lives is an oddly timely product that, if done well, can accurately capture people’s lives in the current age, and also be compelling storytelling in its own right. Searching, the debut feature by Aneesh Chaganty, is the first one of these films that I can recall which adapts the concept around a classic Hitchcockian narrative, and the results are for the most part an effective, suspenseful and taught little film that has enough momentum to keep itself from running out of battery. In this film’s case, the computer(s) used all throughout the film (and take up the entirety of the screen) belongs to family man David Kim (John Cho), who in an early montage we see several web-based episodes in his life, from his daughter Margot’s (Michelle La) educational progress, to his wife Pamela’s (Sara Sohn) eventual succumbing to cancer. Months on from the latter incident, we see through typed IM conversations that David’s relationship with Margot is somewhat restrained, but all of that is about to change when Margot suddenly seems to disappear, and David – via several FaceTime conversations and interviews, online research on social media sites like Facebook and Tumblr, and regular contact with assigned police detective Rosemary Vick (Debra Messing) – learns that the perfect daughter he once thought he knew may not have been entirely honest with him about a lot of stuff. The central gimmick of the film is, of course, the fact that it’s all told from the perspective of several computer screens, but the film is smart enough to not just fall back on the power of that gimmick and instead use it to further enhance the compelling mystery at the centre of it. As “missing child” narratives go, this one doesn’t stray too far from the formula, but thanks to some tight and focused direction on Chaganty’s part it remains a thrilling watch, as you’re there with every step that Cho’s David takes in order to find out where his daughter is, and as he stumbles upon one plot development after another, you really feel his pain and frustration over the situation, not to mention a huge amount of guilt for his failure to connect with her after her mother passes. It’s a much-needed lead role for John Cho, and the actor really hits it out of the park with an emotional and harrowingly natural performance that makes it easy for his character to seem sympathetic and also real at the same time. Both actor and director work strongly together to make the narrative, which does have one or two moments that stretch plausibility just a fraction but not enough to make it completely fall flat, an incredibly engrossing watch that leaves you biting your nails in horrific anticipation of what’s coming next. It’s a movie that just about works in and of itself as an intriguing mystery film before it even gets to its USP of being told from the interface of computer screens. The way that it is incorporated into the narrative is not unlike films such as Unfriended, but this film is obviously adopting the tone of a suspense thriller instead of full-blown horror which gives it a steadier foundation on which to build a world where this kind of social media reliance is completely warranted, and more crucially has something to really say about our constant overuse of it to present a false image of ourselves in today’s society. As David video-chats to several of Margot’s assumed friends from school, most of them admit to not knowing her that well or only studying with them as a means to an end, but once the investigation becomes national news they are all quick to post emotional statuses and videos saying how Margot was a beloved friend, all of which seem tailor-made just to get those precious “likes” rather than genuine concern. That right there is a core example of how this movie uses the Internet and its many resources to show a convincing portrayal of how we all hide our true selves on social media; we’re all guilty of it at some point, including myself in various instances, and this movie does a strong job at portraying not just how false all those positive status updates can seem, but just how the Internet has become a shallow tool to promote dishonest emotions as well as morally questionable services (in the midst of the investigation, David receives an e-mail advertising a website that allows one to livestream a funeral on several social media platforms). It has some compelling things to say about the Internet in this day and age, and it also works as a suspenseful mystery thriller which will leave you guessing right up until the final few reveals, so all in all I was rather fascinated by Searching, a movie which in far lesser hands would have been just a mere knock-off of something like Unfriended but works well enough to stand firmly on its own, and never allows the gimmick to outshine the storytelling. 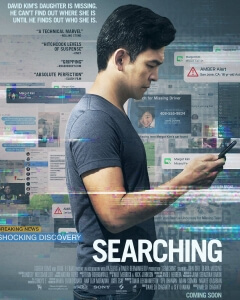 Searching utilises its core concept of everything being told from the perspective of a computer to a fascinating and suspenseful degree, held together just enough by tight direction, a strong central performance by John Cho, and some compelling commentary on the heavy use of the Internet and social media in this modern day and age.